Contrary to popular belief, commercial site demolition is much more than just tearing down buildings. In other words, commercial demolition is an engineered process centralizing on a safe and efficient structure removal. Demolition process varies with the structure but it also requires quite a few skills and precision. Expert contractors keep themselves updated with advanced tools and equipment ensuring safe demolition but there are few precautions that most of the construction companies overlook. 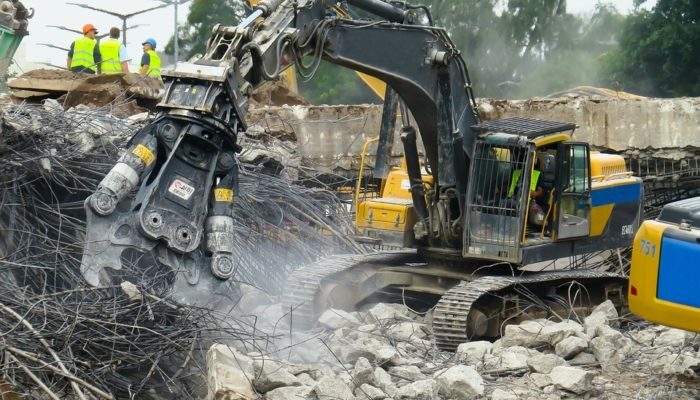 As seasoned civil construction contractors from Louisiana, Palmer Heavy Equipment has put together these five top safety precautions to carry on a commercial demolition process in a safe manner. Make sure that each and every construction employee present on the demolition site is knowledgeable about the equipment that are being used and the ones that should be worn throughout the demolition process. This simple trick not only ensures safety of each employee but may also prevents possible construction site calamities from taking place. Only someone with prior experience should handle the dangerous explosive materials. Explosive handling needs extra care, and only experienced and seasoned employees should be assigned as they are trained to handle all kinds of situations involving explosives. If for any reason, there comes a need for someone to enter the structure during the demolition process, it’s necessary for every ceiling to be braced in order to avoid injuries, accidents, or casualties. In the final stage of demolition, all the employees should clean debris wearing ideal cloths and equipped with necessary equipment. Work boots, mask, and gloves are few very important wearables while debris cleanup. Always ensure that no one other than authorized employees is present there to prevent an array of accidents. It’s common to witness injuries and fatalities in construction and demolitions. Therefore, a safe passage is quite important. These five simple but effective safety precautions can turn down many accidents.